Mount-It! 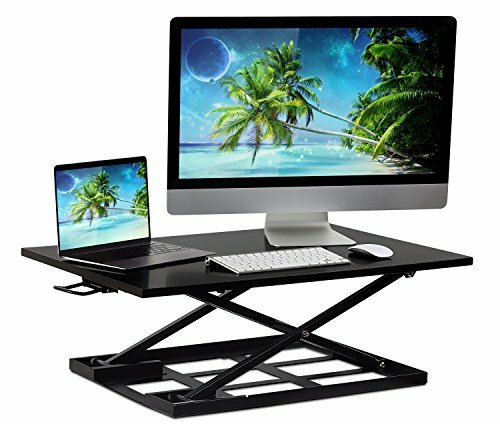 Ergonomic Height Adjustable Standing Desk, Preassembled Stand-Up Desk Converter, Holds up to 20 Pounds, Large Surface Try switching up the way you work by creating a more ergonomic environment. This sit-stand desk makes it easy for you to get comfortable since it is preassembled and ready to use right out of the box! Move from a sitting to a standing position in a matter of seconds with the help of the spring operating lever on the side of the desk. Enjoy using this desk for a variety of activities that you enjoy - it is not limited to using with a computer! Product Features and Specifications: Transition from sitting to standing in seconds. Achieve healthy and ergonomic posture while burning more calories standing up. Use your existing desk or table to start standing, rather than purchasing a more expensive standing desk. Gas spring mechanism assist with raising the sit-stand desk and your computer/monitor. 32 x 22 inch large surface area is large enough to use with a laptop and computer monitor, as well as a full size keyboard and mouse pad. 17 inches of height adjustment without preset height levels allows you to adjust the table to your desired position. Non-slip padding keeps the desk in place and prevents scratching your tabletop. Comes pre-assembled and ready to use in seconds, right out of the box. Compare our price and tabletop size to other similar products with smaller desktop and much higher pricing. ERGONOMIC WORKSTATION - This height adjustable desk gives you the opportunity to work in a more ergonomic and comfortable position, easing pain that you may experience in your eyes, neck, and shoulders from sitting for extended periods at a time. LARGE WORKING SPACE - This sit-stand desk has plenty of space for you to place your computer, keyboard, mouse, and a few other accessories! When you feel the need to stand and stretch your legs, raise your entire workstation to the height you desire. EASY TO USE - Moving from a sitting to standing position can be done in a matter of seconds with this desktop stand up desk. Squeeze the lever on the side of the desk and the spring mechanism will raise and lower the desk in a fluid motion. VERSATILE - Use this adjustable standing computer desk for a variety of activities including reading, drawing, eating, and even studying! Enjoy the activities you love in a comfortable position without feeling strain on your body. QUALITY MATERIALS - This desktop riser for standing is made with sturdy materials to make your experience that much more enjoyable. Start increasing your productivity and comfort levels today!